West County Center, located in Des Peres, MO at the corner of I-270 and Manchester Rd, is among the more successful malls in the St. Louis area. First opened in 1969, the mall closed January 2001 for major renovations. The new West County Center opened September 2002. Across Manchester Rd, less than 250 meters away, lies the headquarters to Edward Jones. Edward Jones is in the midst of a major expansion in the St. Louis area, adding almost 900,000 square-feet of new office space and up to 1,000 jobs over the next few years. The 225,000 square-foot eastward expansion of the Des Peres headquarters is presently nearing completion. Yet, despite the proximity of these two centers of commerce and employment, pedestrian access between the two is almost non-existant. 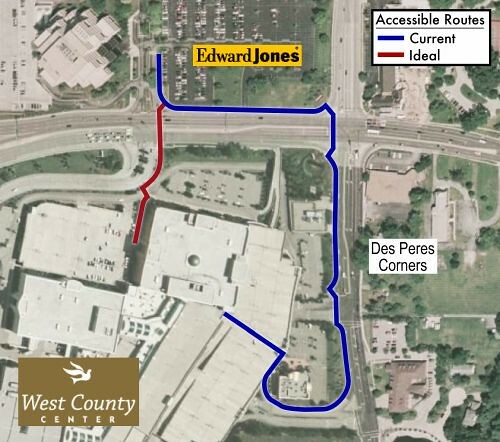 Map showing the current and ideal accessible routes from Edward Jones to West County Center. The current (blue) route is 740 meters long; the ideal (red) route, 220 meters. Say, for example, an employee of Edward Jones wished to walk to West County Center for lunch. As can be seen in the map above, the only accessible route presently available to the mall from Edward Jones is via Manchester and Ballas roads to the mall’s eastern entrance, an uncomfortable 740 meter long walk. This needlessly long walk is necessitated, primarily, by the lack of a sidewalk descending the grade from Manchester Rd to Macy’s on the malls’s northern end. Including a sidewalk here would reduce the walking distance between the mall and Edward Jones to only 220 meters. Bus map showing the 57 Manchester at West County Center. // Metro. Even the routing of the 57 Manchester bus acknowledges the deficient pedestrian accommodations at West County Center. As shown in the map on right, buses detour off Manchester Rd to Ballas Rd to reach the eastern mall entrance. This detour, easily, adds 2-5 minutes to the commutes of bus riders not stopping at the mall. Even if improvements were made, it’s difficult to say how many people would make the trek from Edward Jones to West County Center. The 7 lanes of high-speed traffic on Manchester Rd make crossing the street a daunting adventure. Still, the city of Des Peres needs to step up and require better of its developments. As seen with the recently opened Des Peres Corners development, the city fails to review plans to make sure pedestrians are adequately accommodated in accordance with the ADA; responsibility appears to be left solely with the developers. The city of Des Peres needs to realize that it’s their responsibility, too. I saw 6 construction workers making their way across Manchester during the lunchtime rush hour back to the Ed Jones Campus basically at the red route crossing in the pic above. I was worried for their safety, but they sprinted across Manchester and out of harms way. Scary to be a pedestrian around there.